A home brewer for 30 years, Tim Kovac is Founder and Brewmaster for Small Town Brewery, best known for its “Not Your Father’s” line of artisanal, gruit-inspired craft beers. In our “Talking With” series, Kovac tells Modern Restaurant Management magazine why restaurant partnerships were so important to growing his brand, why craft beer still has untapped possibilities and how beer is in his blood and it changed his life. What about gruit-inspired beers inspired you? We’ve always been interested in going back to our roots at Small Town, with our brews recalling a simpler time in American life. Gruit (German for “herbs”) is an ancient way of bittering and flavoring beer using roots, spices, flowers, and berries. This is how most beer was brewed for thousands of years and throughout the middle ages – before hops took over as the main bittering agent – and it gives our beers a distinct character that sets it apart from the rest of the craft pack. What challenges do you see facing the restaurant industry and craft brewing, in particular? We think the challenge for operators today is striking the right balance in their beer offerings. Any great beer program should include the right mix of nationally recognized brands alongside a strong selection of interesting craft brews. With all the amazing craft brands available today, operators need to stay close to their guests to continue to offer all the interesting tastes and flavors they crave. With all the amazing craft brands available today, operators need to stay close to their guests to continue to offer all the interesting tastes and flavors they crave. For craft brewing, we say it’s time that the beer industry gets in the game to take share back from wine & spirit brands and we’ve shown we are willing to get very creative to accomplish this task. For us this means, we really focus on listening to what consumers want and then providing them with quality products to meet their desires. The beer industry as a whole is now incorporating that sort of listening and we’re delivering products that people want to drink, whether that product is a craft beer, an import or a cider. Why did you choose the name Small Town Brewery? I’d been a home brewer for 30 years. Family lore is that brewing has been in my family for many generations; this has served as an inspiration to me. When I decided to pursue my passion full-time, I quit my job at a graphic arts firm and devoted myself to brewing. I wanted to honor my family beer making tradition by creating specialty beers with unique, all-American flavors using botanical ingredients. The name “Small Town” captures the humble beginnings of our brewery as well as our commitment to the kind of America you find on Main Street. Why did you choose the “Not Your Father’s” name? We wanted a fun name that would highlight the adult nature of the beverage, while also doubling as a reference to my father and grandfather’s history with the recipe. What about craft brewing is so appealing as a connoisseur and entrepreneur? The appetite in the market right now for new and exciting craft creations means there are tons of unexplored possibilities for anyone looking to expand what’s out there. The demand for more variety and quality means there are many untapped entry points into the market that could be the next big thing. It requires always being creative and always being aware of what’s out there – perfect for connoisseurs and entrepreneurs alike. How did you grow your business through restaurant relationships? In the early days of Small Town, the people of Chicagoland were so tremendously support of us, and for that, we will always be appreciative. As a small local brewer, our restaurant relationships allowed us to get our beer and our name in front of people far more quickly than we could have done in the taproom alone. Today, we still hold dear our restaurant partnerships, and look forward to many years of comradery over a snifter of Not Your Father’s with these great folks. With the landscape for craft brewing become so competitive, how do you set yourself apart? Our beers have a distinct goal of capturing flavors that stir nostalgic memories in our consumers, and it has had the added benefit of appealing to a wide group of people. Not Your Father’s brews have found success across demographics, with people who favor beer and people who don’t. We’re also unique for our gruit brewing style, which is essential in our quest for immediately recognizable all-American tastes. What do you love about what you do and what do you feel are the most challenging aspects of what you do? We love seeing people getting the chance to try our products for the first time – there is always genuine surprise and joy at the classic soda taste. Getting that taste right is the hardest part – we test these brews for months before they’re ready, and finding the right balance of ingredients can be a tightrope walk. In what ways do you envision growing the company? We’re diligently working on new brews to bring to market in the coming year, so stay tuned for more information there. Our product development is influenced heavily by customers and visitors to our brewery/brewpub, who often provide feedback and inspiration. As we work to re-interpret more traditional gruit beer recipes, there’s nothing we enjoy more than sitting with customers at our Brewpub or speaking with them at fairs and festivals hearing how much they enjoy the product. Our customers will help determine what’s next on the horizon. What is your personal favorite of your product line and why? This is like choosing a favorite child! But if I was forced to choose, I’d probably have to go with the classic Not Your Father’s Root Beer. 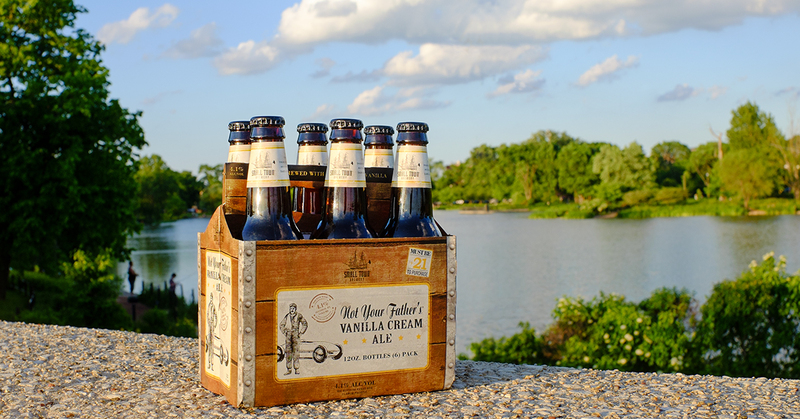 It’s the beer that started it all, changed my life, and it still goes great over a scoop of vanilla ice cream.